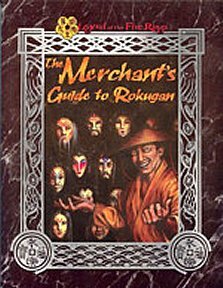 The Merchant's Guide to Rokugan contains complete rules on the Kolat conspiracy, including its history, prominent personalities, and ways to integrate both into your Legend of the Five Rings campaign. Publisher's blurb: "They whisper it behind closed doors: a word so mysterious that even the spies of the Scorpion clan have no inkling of its true power. It is the name of secret conspiracies, of dark deeds, and of sinister plans stretching back to the dawn of Rokugan. Those who know it spend their nights in fear. Those who seek it find nothing but empty legends. Those who defy it disappear before they even realize their peril. "Now, for the first time, learn the secrets of this dark thorn in the heart of the Emerald Empire. Discover the conspiracy that began with the fall of the Kami and now stretches from the Kaiu wall to the northern reaches of the Phoenix lands. See the invisible networks, hidden behind bags of koku and friendly merchants, which elude the Hante's most diligent spies and work towards a goal that only their hidden leaders can see. Hear the stories of the men and women at the Kolat's heart - ruthless puppet masters who disguise their agendas beneath the laws of bushido. Can your sword pierce their veil, and destroy what a thousand years has failed to unearth?"